Some people have a naturally strong and commanding presence when they enter a room, while for others this can be difficult. These type of people walk into a room and can almost immediately command attention, knowing how to control the responses or emotions around them. 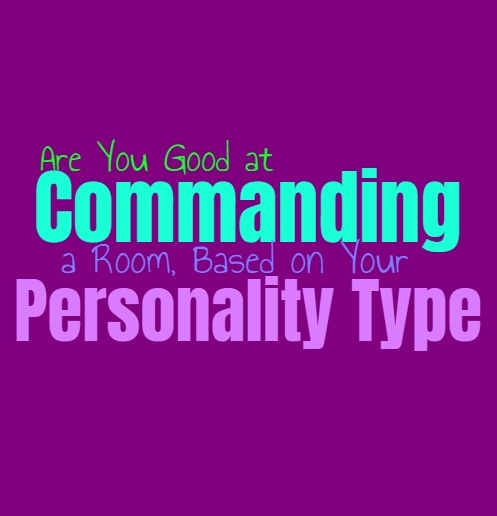 Here is how good you are at commanding a room, based on your personality type. INFJs are not often the commanding type, mostly because they prefer to observe and take it all in from the sidelines. While they might not actively be seen as the people who will command a room, that does not mean they are incapable of it. Most INFJs don’t really tap into this part of themselves, but their strong sense of empathy and intuition does make them highly capable of having a commanding presence. INFJs throughout history have been known to execute a sense of mental control over others, being very capable of pulling people in and convincing them of many things. The fact that they spend so much time just observing and soaking things in, makes the INFJ even more capable of this. ENFJs often have a naturally commanding presence and are very capable of obtaining the focus of others. They actually use their sense of empathy to help them understand the people around them, and even recognize how to command their attention and respect. ENFJs can be very strong-willed people, doing whatever it takes to accomplish their goals. They can certainly command a room, and often help to adjust the mood around them. ENFJs are naturally good when it comes to understanding people and what it takes to convince them or things or please them. INFPs aren’t often seen as the commanding type of people, since they are a bit more inward and focused on their own thoughts and emotions. When it comes to the day to day, INFPs usually don’t find themselves attempting to command a room or the attention of those around them. While this isn’t necessarily their common response, that doesn’t mean it isn’t something they are capable of in certain circumstances. INFPs who strive to become performers are often capable of flipping a switch when it comes to going on stage or performing their art and talents in front of others. In these situations they can certainly be capable of commanding a room and becoming the center of attention. ENFPs are often outgoing and likable people, possessing both playful and sensitive personalities. They have a way of drawing people in and demanding attention from those around them. This friendly and charming part of the ENFP does make them capable of commanding attention from others, but they aren’t necessarily drawn to the idea of adjusting the mood or behavior of those around them. Their focus becomes less about others and more about being the center of attention. ENFPs often enjoy this type of attention for a short time, since they do like feeling close to others and liked by them. INTJs are often commanding and strong-willed people, but they aren’t usually focused on commanding a room. They can be rather internally focused, becoming rather caught up in their own thoughts, goals and inner minds. For the INTJ it isn’t impossible to command a room, but they often do this in very different ways than feeling types might. For them INTJ it isn’t about understanding the people in the room in an empathetic manner, it is about convincing them of their own strength and abilities. It becomes about the INTJ and their advanced knowledge and ability to get the job done, and so in this way they sort of demand a sense of respect from others. ENTJs do not command a room in the way some feeling types might, but that does not make them incapable of it. They often command a room in a more direct manner, showing their knowledge and their strength. ENTJs are natural leaders and so they can often step into this commanding role without much difficulties at all. They are often direct about, stepping into the position without trying to make it over the top or dramatic. ENTJs know how to lead and demand a certain level of respect from others, making their naturally commanding presence useful in these situations. INTPs aren’t often likely to command a room, instead they are more focused on doing things behind the scenes. They don’t like needing to have a commanding presence, nor do they enjoy having to find ways to manipulate or control people. INTPs are often much more focused on doing things their own way, without needing to command a room in order to do this. INTPs actually become drained with people most of the time and so they prefer to be the fly on the wall rather than the person with the commanding presence. ENTPs do often have a natural way of commanding a room and the attention of everyone in it. They have somewhat larger than life personalities and can be great at becoming the center of attention. Sometimes they do this in order to enjoy being around others and have a good time, while sometimes it is about finding ways to navigate their surroundings and understand the people around them. ENTPs are capable of using both logic and empathy in these situations, in order to command a room the way they want. ISTJs are often more focused on getting things done and don’t really need to be surrounded by people. They can be independent when it comes to working, and when it comes to most things in their lives. While ISTJs are capable of being leaders and of fitting into these roles, it isn’t necessarily something they strive for. They can often command a room when it is completely necessarily and when they can see that no one is taking the appropriate leadership role in order to get things done the right way. ESTJs are often skilled at commanding a room, especially if no one is stepping up into this role of leader. They know how to express their sense of efficiency and knowledge so that people know they can trust and rely on them. ESTJs want to be able to get things done efficiently and don’t like allowing anything to stand in their way. When it comes to commanding a room and ensuring that things get done, the ESTJ will do their best to maintain a sense of focus and to convince others that they can be trusted with this position. ISFJs are naturally empathetic people, which helps them understand how to communicate with most people. They care about pleasing others and do their best to create a sense of harmony. While ISFJs might not command a room in the most obvious of ways, they can often do this more discreetly. ISFJs often find ways of adjusting the behavior of others so that they can maintain a sense of control over their surroundings. They do this in order to please those around them, wanting to find ways to making them happy and of avoiding a sense of discomfort. ESFJs are often outgoing and empathetic people, which are qualities that can help them maintain a more commanding presence. While ESFJs might not command a room in an aggressive or direct manner, for them it is often far more subtle. They command a room by being outgoing and friendly, and by understanding the emotions and needs of those around them. Being able to connect with and understand the motivations of others, really helps the ESFJ to command a room in their own unique way. ISTPs don’t really like feeling as if they have to command or control a room. For them it is better to focus on doing their own thing and living a more independent life. While ISTPs can be charming people, this doesn’t mean they have any desire to really command a room. They can often be so focused on facts and on doing their own things, that they don’t really find it natural to try and command a room or have a leadership presence. ESTPs are often outgoing and charming people, who are good at getting attention from others. While ESTPs are great at being center of attention this doesn’t mean they have a naturally commanding presence. ESTPs don’t really like commanding a room or being the person trying to control the responses of others. For them it can actually feel like too much responsibility and isn’t really something they are comfortable with. ISFPs don’t really like commanding a room or being the people trying to lead others in a certain direction. While they can be friendly and lovable people, this doesn’t mean they have a naturally commanding presence. Most ISFPs are more focused on their own thoughts and feelings, wanting to do whatever inspires them most. They don’t like the idea of trying to control others, nor do they want to feel controlled by anyone. ESFPs can certainly command all of the attention in a room, since they are outgoing and often charismatic people. ESFPs enjoy being the center of attention, wanting to be capable of making others smile and of elevating the mood around them. ESFPs can certainly draw attention but this doesn’t mean they command a room in the more practical sense. They don’t necessarily have a knack for being able to command people in a leadership sense, since this can feel like more responsibility than they really want.